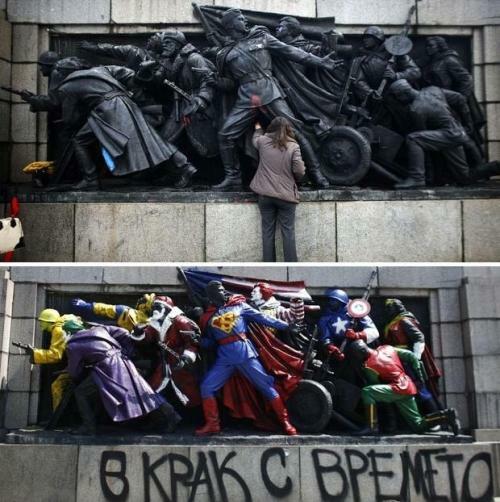 From what little information was available, apparently this group of statues was created to commemorate war heroes, but recently it was vandalized to look like statues of superheroes like Captain America and Superman. Now a lot of people find this really cool, but I have to say this is where I disagree. I have two issues with this: First being that I really don't think it's awesome to take a statue that was created in honor of a soldier who died for something and then turn it into Captain America. I love comic book heroes as much as the next person but that doesn't make it ok to vandalize a war memorial, does it? Obviously I don't know the context of the original statues, so I will say that I suppose it would be ok to vandalize the statues if the people they were commemorating were really big douche bags or something. My second issue is why the hell was Ronald McDonald included in that picture? Yikes. Am I being too harsh? What do you guys think about this? Written by: Katie Shew at 3:09 p.m.